According to employees, one of the oldest McDonald’s will be closing on February 28th until roughly mid June for renovations. 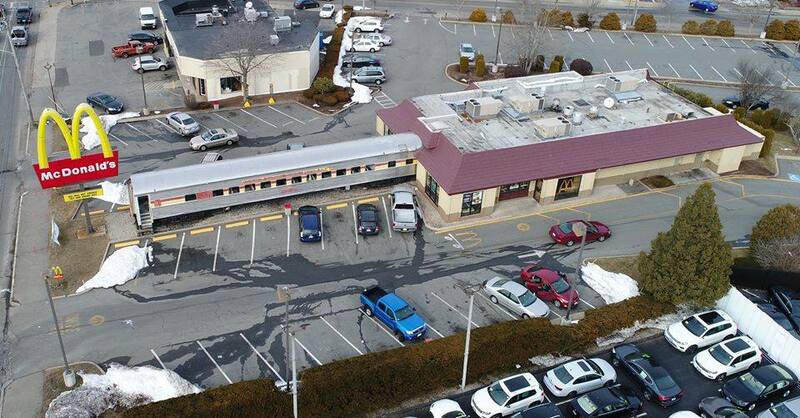 The renovations will involve removing the historic and well known train along with totally redoing the building at 44 William S Canning Blvd in Fall River. The train has been a Fall River landmark since it first arrived on a trailer in 1982. At one time it had seating so you could eat in it. What is your fondest memory of the McDonalds Train? I know the entire story of the McDonald’s at 44 William Canning Blvd. It opened in November 1962. I designed, purchased, and opened the train in July 1982. Lots of history. Hey Mitch, do you know of any video footage or pictures taken of the train car as it was being moved into Fall River? I heard through a friend that a video was taken but he was never able to figure out where his copy was, if it was still around. Thanks. I have all the video tapes of the train and also of the grand opening. Michael, I do have the tapes of the train being moved and of the grand opening. The New Haven Railroad Historical Society filmed everything. I have tons of photos of the train being refurbished and much more. I don’t believe your friend had what I have. Thank you for the reply Mitch. I believe my friend, Tom, was part of the New Haven Railroad Historical and probably got his copy through them. Would it be possible for you to post the video (If possible) to Youtube or another social media site for public viewing? It will be greatly appreciated! Thanks again.